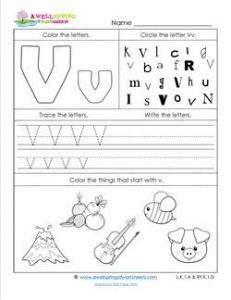 In this letter v worksheet (one in the set of all of our abc worksheets) kids get to practice all their alphabet skills: They practice their coloring skills by coloring the upper and lowercase Vv. They can get out their sleuthing skills and find the Vv’s (one uppercase and one lowercase per row). They can neatly trace the letters and they can write some more all on their own. And lastly, they can sound out the objects and color the three that start with the /v/ sound.